Sergio met us right on time at the cruise port, with a big smile and a full itinerary planned for us. His English is excellent and his van very comfortable. He is congenial, witty, and personable. Our drive to Furnas was so interesting, with photo stops along the way and a drive through a few small local villages. Thanks for a great day and we'll see you again soon! What a fabulous tour. Our guide showed us so many beautiful areas of the island as well as the sea beyond. We were fortunate enough to come on a rare day where the sun was shining, no clouds in sight and you could see for miles. Apparently that doesn't happen often. We felt as though our private tour was so special and we were able to see so many hidden gems that most visitors don't get to see. Glad we chose a private tour instead of a bus full of tourists. We would definitely book with Sergio again. I arranged this tour with Sergio thru you because we were traveling on a cruise and I wanted to make the most of our day there. My great grandparents migrated to Hawaii from Ponta Delgada, Portugal in the late 1800s and due to some really great work by a cousin, I knew of the street they lived on, the areas they lived in, and the churches they attended. Sergio was so helpful ! This was a great day. Sergio was fantastic! TOUR GUIDE RESPONSE: Hello from the middle of the Atlantic!! Many, many thanks for your kind words Mrs. Meredith. Hope to see you for a next time. Easy to find outside cruise terminal. Offered to adjust planned itinerary to my needs (stayed with Furnas Hot Springs since the web cams he checked showed fog at other volcanic calderas). Clean and comfortable Jeep. Safe driver. Knows his island(s) country and how to reach the best tourist spots before they get crowded with tour buses. Excellent tour. Highly recommend! Sergio is amazing!!! The beautiful thing about a private tour is that the tour guide can be spontaneous and adjust the tour as needed.....we had our planned hiking tour cut short due to fog and rain, but Sergio was able to turn a hiking tour into an incredible sightseeing tour with things to do in the local city as well. We felt as though we were not tourists but his family members hanging out with him for a day of fun and relaxation. FORGET THE GROUP TOURS!!!! Book Sergio!!!! Sergio was a fantastic guide...so knowledgeable, professional and friendly!! He customized the tour to our liking and was extremely flexible with how much time was allowed at each stop. Highly recommend, you won't be disappointed with Sergio...he is worth every €!! We had a great time. In addition to experiencing the beauty of the island, we also learned much of the geological and cultural history. Sergio adjusted the timing and order of the stops to accommodate the unpredictable weather, and so our visit to Fire Lake included beautiful views and scenery. In addition, throughout the day, we gained a wealth of information about the people and culture of Sao Miguel. Sergio was a fantastic guide and we couldn't help but be infected by his enthusiasm. We selected Sergio for our tour from Ponta Delgada. I am sure the other options were good also but I don't know how they could have been better than Sergio. What an engaging, knowledgeable, delight to be around and with. Stopping whenever we wanted, making suggestions to stop when we missed something. Made you feel like you had all day with him when in fact he had another tour right after ours. Being a native, he has an insight and knows how to present that info in a very meaningful way. 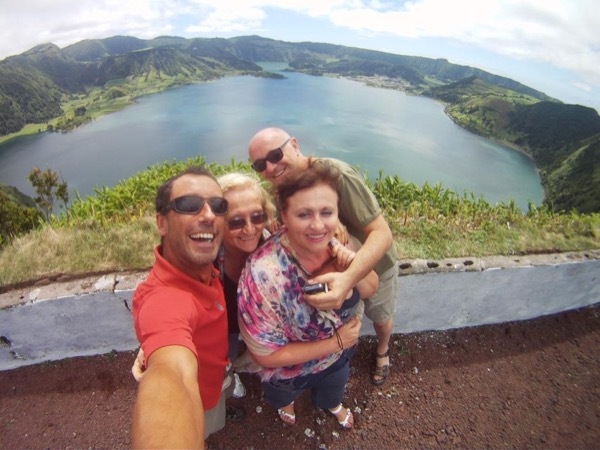 We had a great time with Sergio touring Ponta Delgada. The lakes are beautiful as well as the country side. We were able to go places that a tour bus could never go and stop for pictures on a whim. We stopped for coffee and sweets in a local village. Sergio is very knowledgeable and friendly. He is well versed in every aspect of his country. My husband uses a walker and he was able to accommodate four of as and a walker. We would highly recommend this tour with Sergio. Sergio is one of the best guides we've ever had. He clearly knows EVERYTHING about all 9 of the Azores islands, the people, the customs, the food. He's extremely personable, flexible (and their changeable weather requires that!) He's a friendly, upbeat guy with good English skills, and he goes out of his way to make sure his clients are happy. I wish they were all on his level. Wonderful tour!! Sergio made us really want to return. Fantastic guide. The second time we have enjoyed Sergio's good company, knowledge and enthusiasm. Highly recommended. Be sure to ask him to drop you at the local bar/restaurant he favors. You'll be the only tourists there and very happy for the experience and the very delicious and very well priced lunch!